The first thunderstorm of the summer is going on outside, and it is lovely. We live in Orlando, smack in the middle of Florida (but about an hour from Disney World. Don’t get too excited). Florida is officially nicknamed the Sunshine State, which both is and isn’t inaccurate. When it’s not raining, the sky is generally bright blue, with maybe a few pretty clouds. We have lovely skies here, every day. But the rain! Summer here lasts roughly May through September, and it rains four or five days out of every week. Usually between 3-5 PM, and usually a thunderstorm that pours like crazy for about half an hour. Then it leaves, with an awful mugginess in its wake. Every week or two we get a really good one, heralded by a cool breeze and blissful cloud cover–the only time it’s cool outside–and then everyone makes a run for the nearest building while lightning flares and windows rattle with thunder. There are also times it doesn’t rain for a week, and everyone takes to looking up suspiciously, waiting for the shoe to drop. And occasional days when it rains, with or without the terrific thunder and lightning, all. day. long. Tonight it’s the first storm. Yes, the storms get a bit tiresome after a while, but this is the first one of the season, and I’m feeling inspired. It’s getting dark, it’s raining out and cozy in, and it’s a perfect night for a comforting hot dinner. Like this potato soup, for example. How about that bread bowl! Also. Creamy soup without cream? What is this sorcery? Seriously. Admittedly, there is dairy involved, but most of the perfection of this soup comes from blending the potatoes themselves, transforming into a gorgeously smooth and satisfying soup. Yukon golds are my favorite potato, but I made this soup with regular ol’ russets and it turned out fine. It’s great for cozy winter evenings or being inside while it rains outside. Despite the creaminess, it’s not at all too heavy for summer. If you’re super fancy and have an immersion blender, achieving this texture this is really easy—just stick the blender into the cooked potato mix and turn it on. If (like me) you don’t have a stick blender, you can get the same effect by whizzing a few ladlefuls at a time in a blender. It takes a bit longer and you want to be careful when blending hot liquids, but it’s worth it. You can also give it a bit more texture, if you so desire. Dice the potatoes small, and blend only about half of the soup. It will still be somewhat creamy, and it’ll have little potato and onion bites. I personally like to blend the heck out of the potatoes and use the bacon for texture. Optional toppings include extra cheese, bacon, and sour cream. Non-optional toppings include CHIVES. Chives look like grass but taste a little like green onions. You could also use green onions, but if you have access to chives, definitely try them! They are the perfect little pop of herby contrast to the other rich flavors here. 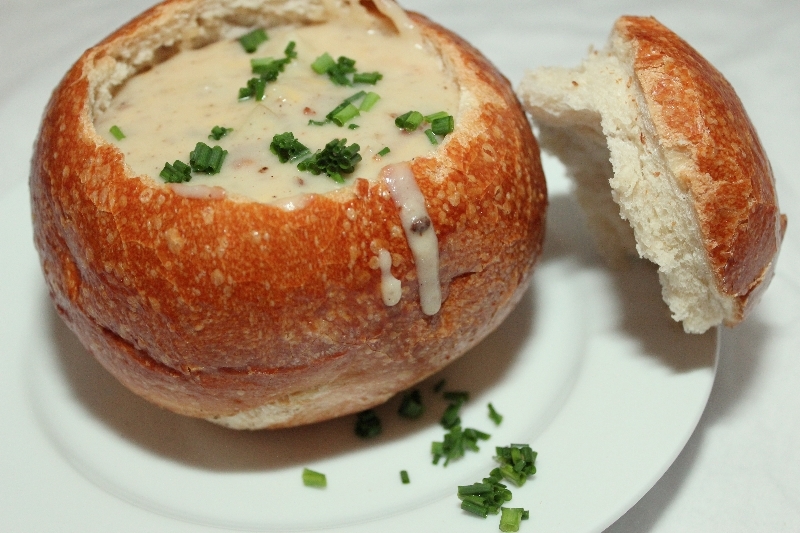 To take it really over the top, eat this soup out of bread bowls. You won’t be sorry. And you can also make this for your vegetarian friends–just make with butter and leave out the bacon. Recipe very slightly adapted from the brilliant Ali at Gimme Some Oven. The creamiest potato soup, without cream! 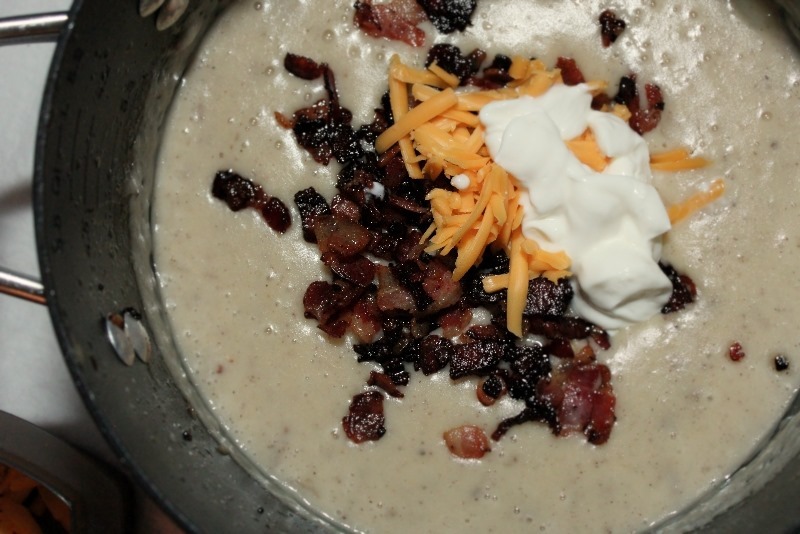 Potatoes give this soup its beautiful texture; bacon and cheese give it flavor. Recipe very slightly adapted from Gimme Some Oven. Heat a Dutch oven or large pot over medium. Cook chopped bacon until crispy. Remove the bacon with a slotted spoon and set aside. Pour away the bacon grease, keeping about 3 tablespoons for the next stage (or use butter instead). Cook the onion in the reserved grease / butter until transparent, 3-5 minutes. Stir in the flour and let it cook for about a minute. Slowly add the chicken broth, stirring constantly to get the lumps out. Add the milk and potatoes and give a quick stir to combine. Bring the mix to a simmer. Simmer for about 15 minutes or until the potatoes are soft when you stick ‘em with a fork. 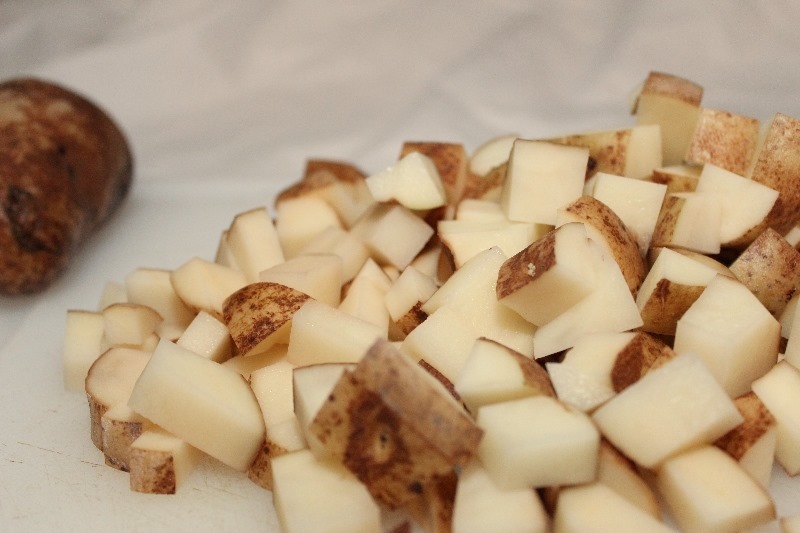 Use a regular or immersion blender to turn the potatoes into creamy perfection. Return soup to pot, if it wasn’t there already. Stir in cheese, sour cream, and some of the bacon (save some for topping). 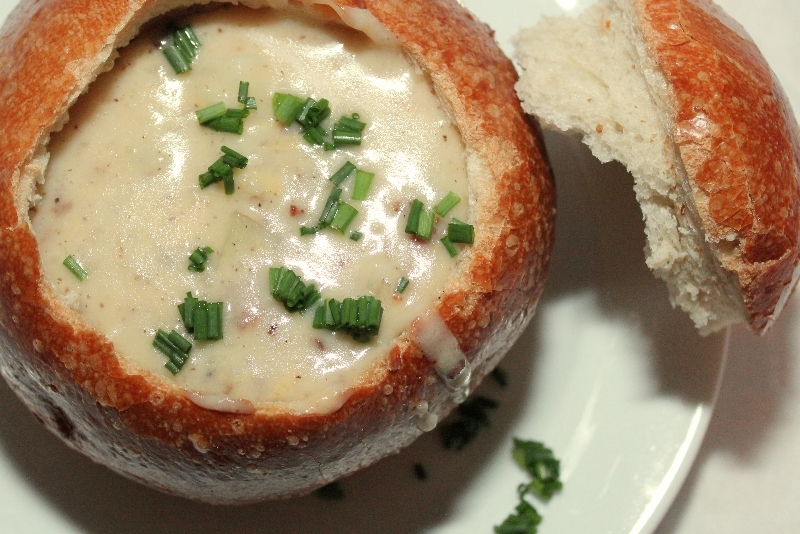 Ladle into bowls—bread bowls for bonus!—and top with reserved bacon, chives, and whatever else your happy heart desires.